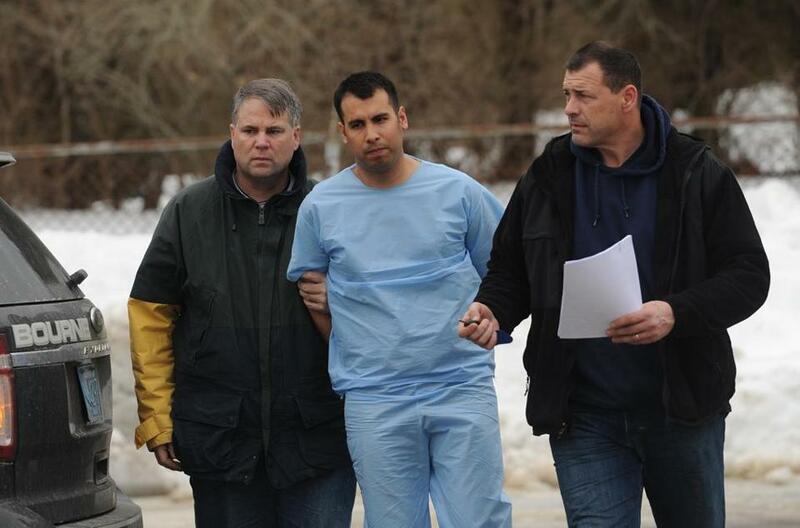 Authorities say Adrian Loya had a plan: On his 31st birthday, he would murder Lisa Trubnikova. So he allegedly wrote an essay about why his fellow Coast Guard member deserved to die, and he traveled to Bourne from his home in Chesapeake, Va. He stalked Trubnikova and her wife, videotaping them with a camera affixed to a tree outside their Roundhouse Road house, according to court documents. And in the early-morning hours of Feb. 5, he allegedly armed himself with three guns and blasted his way through their door, a black mask pulled over his face and a video camera strapped to his chest to capture Trubnikova’s final moments. Court documents unsealed recently after a request from the Cape Cod Times shed new light on Loya’s alleged violent rampage, during which he allegedly set his car on fire, scattered hoax bomb devices to slow police, shot Trubnikova to death and wounded her wife, Anna Trubnikova, and engaged in a gun battle with police, shooting one Bourne police officer in the back, before surrendering about a half-hour later. The Times first reported the documents early this month. They include police reports and search warrant affidavits and returns. Loya pleaded not guilty in Falmouth District Court last month to a spate of charges including murder and was ordered held without bail. He was sent to a facility in Bridgewater for evaluation, and he is still being held there, said his attorney, J. Drew Segadelli. Segadelli disputed the narrative set forth in the law enforcement documents, saying it is too early in the investigation to draw conclusions about what happened or why. Jared MacDonald was shot in the back earlier this month by a gunman armed with three rifles and a handgun. He said information contained in the court documents was “extremely limited” and said more information is still coming to light, though he declined to provide specifics. Brian Glenny, first assistant district attorney for the Cape and Islands, declined to comment on any of the evidence in the case but said prosecutors are confident that Loya’s alleged actions meet all three theories for first degree murder: premeditation, extreme atrocity or cruelty, and felony murder. Loya and the Trubnikovas were all in the Coast Guard. Officials said Lisa Trubnikova, 31, was a petty officer stationed in Cape Cod; Anna Trubnikova, 30, was a petty officer stationed in Woods Hole; Loya was stationed in Virginia. The documents do not state what that interaction was, but Trubnikova’s relatives said Loya had become romantically “fixated” on her, even though she had shown no interest in him. A search warrant affidavit refers to “an essay written by Loya describing his reasons for killing Lisa Trubnikova,” and another document reports that a 250-page essay was discovered during a search, but the documents do not describe the contents of the essay. Before he arrived in Bourne on Feb. 1 and checked into Room 101 of the Quality Inn on Trowbridge Road, Loya allegedly told police that he made several hoax explosive devices in his Shoal Creek Trail home in Chesapeake. On the morning of Feb. 4, he placed a digital camera in a tree to monitor the comings and goings of Trubnikova and her wife, according to the documents. In the early morning hours of Feb. 5, he allegedly told police, he watched the footage on his laptop. Around 2 a.m., Loya, who was allegedly armed with a shotgun, a rifle, and a handgun, parked his car sideways across Roundhouse Road and lit it on fire with flares and charcoal so that other vehicles could not get by, according to the documents. He allegedly placed hoax bomb devices around his car and the Trubnikova home to slow police. With a camera allegedly strapped to his chest, he walked to the Trubnikovas’ home, shot through the locked door with the shotgun, and stormed into the bedroom, where he found the two women in bed, according to the documents. He ordered them to get up, according to the police report, and allegedly started shooting at Lisa Trubnikova, hitting her several times in the legs and torso and killing her. Anna Trubnikova was also seriously injured but managed to call 911 to report the shooting, according to the documents. Loya then allegedly left the Trubnikova home and began firing on police as they arrived on scene, hitting Bourne police Officer Jared MacDonald in the back under his bulletproof vest. Neighbors described a chaotic chase scene, with Loya zig-zagging through the neighborhood, before sitting down on a neighbor’s deck and surrendering silently around 2:48 a.m., about a half-hour after the first 911 calls came in. In Loya’s hotel room, police found black face masks, handcuff keys, duct tape, fire-starting material, a survival handbook, a mess kit, a first aid kit, zip ties, a knife sharpener, and other items, according to court documents. In the Trubnikova home, they found the wreckage left by Loya’s alleged burst of rage: a shotgun, two pairs of handcuffs, bullets, casings, spent shotgun shells, and blood stains.